Last week New York City Mayor Bill de Blasio, who was elected on a progressive platform and is also a former Clinton campaign manager, said he is holding out endorsing her until he sees "an actual vision of where they want to go." Perhaps the reason for the lack of endorsement was revealed today. According to a report in the NY Post de Blasio is hoping to get drafted to run for president. De Blasio’s hope, the [national political party] operative said, is a “draft de Blasio’’ movement will develop among progressive activists over the next several months that will lead to the mayor being able to defeat Clinton in the primary elections next year in much the same way leftist Sen. George McGovern successfully challenged the initially front-running establishment Democratic candidate, Sen. Edmund Muskie, more than 40 years ago. Standing ready to back de Blasio against Clinton, said the operative, is the state’s small but influential Working Families Party, which has strong ties to de Blasio and is funded by some of the nation’s most powerful labor unions. Actually that may be a good thing. De Blasio playing the role of George McGovern would be fun political theater and hopefully his results would be similar to McGovern who got crushed. He earned only 38% of the popular vote and 17 votes in the electoral college. “With Warren saying she’s not running, de Blasio and his advisers are trying to position the mayor as the ‘draft’ candidate for the left in 2016. That’s why he refused to endorse Hillary last week,’’ contended the operative, who is involved in presidential politics. The draft effort explains why de Blasio was accompanied last week on his “progressive” speech-making trip to Iowa by John Del Cecato, one of the nation’s most important Democratic communications strategists and the man responsible for the popular “Dante” TV spot that helped get de Blasio elected mayor, said the operative. “Why would your ad maker be traveling with you in a non-campaign year? Why was he there with de Blasio in Iowa unless you’re trying for something bigger?’’ asked the operative. For Del Cecato, an expert in Iowa politics and a longtime campaign adviser to President Obama, helping develop a draft effort for de Blasio may also be personal. Del Cecato was described by the operative as “part of the faction of Obama advisers who still deeply dislike and deeply distrust Clinton’’ dating from the time the two faced off in the Democratic primaries in 2008. 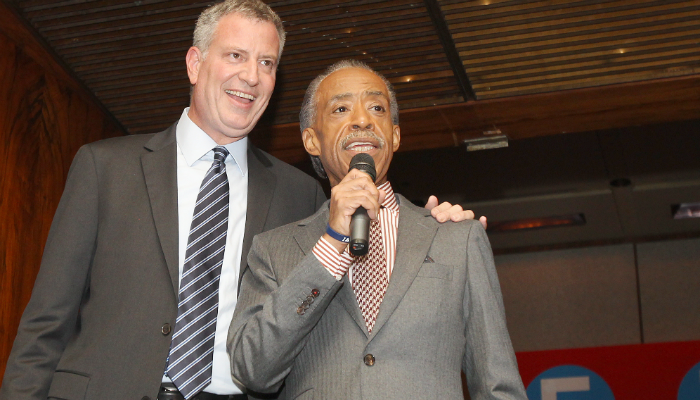 While some might laugh at the report, de Blasio does have some presidential qualification, like President Obama he is good buddies with the Faux Reverend Al Sharpton and his approval ratings have fallen so low he is trying to give non-citizens the right to vote so he has a chance of getting re-elected.